Discover the crucial purpose behind Bali's hypnotic ceremonies in this educational documentary film, part of the series Sacred and Secret: Balinese Rituals and Beliefs, an ideal tool for the anthropology or comparative religion classroom. The Indonesian island of Bali is home to some of the world's most elaborate and ornate rituals, featuring eye-catching costumes of red and gold, hypnotic dances and musical traditions that are both alien and tantalizing to Western ears. However, few visitors understand the secret meaning behind these timeless traditions. 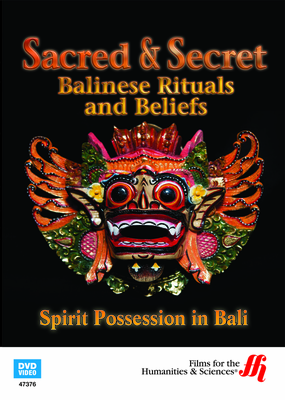 This educational DVD, part of the series Sacred and Secret: Balinese Rituals and Beliefs, provides students of anthropology, dance, or comparative religion a behind-the-scenes look at some of Bali's most sacred rituals and the singular purpose at their heart: communication between this world and a world beyond our own, a world inhabited by spirits, angels and demons. Viewers will witness the famous barong dance, as well as ceremonies not performed for Western eyes, including an invocation of the goddess of death and an elaborate cremation ritual. In the process, students will learn about the concepts sekala and neskala, the seen and the unseen, establishing the secret power behind the fascinating Balinese life of ritual.